In late March of this year, a mountain lion killed a mule deer fawn in the city limits of Durango (in the Crestview neighborhood) within blocks of an elementary school. This prompted a lively discussion among locals about Durango’s burgeoning deer population and a possible solution to what is rapidly becoming a problem. Mule deer are a primary prey species for mountain lions, and research has indicated that an adult mountain lion may kill one deer per week. Throughout the West, mountain lion populations are steadily increasing. Renowned wildlife biologist Maurice Hornocker says “there may now be more mountain lions in the West than there were before European settlement.” Without intervention, urban mule deer populations will continue to increase, likely bringing an accompanying uptick in mountain lions seeking prey within Durango city limits. Urban deer populations creating problems for residents is not unique to Durango. According to a recent Time article by David Von Drehle, America’s rapidly increasing deer populations have multiple negative impacts, including devouring crops and gardens, spreading tick-borne disease, and over a million automobile accidents totaling more than $4 billion in damages annually. Several local gardeners have reported the sad story of their gardens, carefully tended, loved, and watered, being reduced to naked stems in one evening by local deer. Several times in the last decade, I have spotted muleys with broken limbs limping pitifully through the snow after a collision with a local commuter. Durango has become a sanctuary city for opportunistic mule deer. Is this what is best to perpetuate a wild species? Are we unwittingly wreaking havoc with the evolutionary biology of mule deer by conditioning them to ignore potential predators because they have grown tame in a human-dominated environment? Habituated urban deer herds are not healthy herds. They are no longer browsing on plants found in their natural habitat, and are rapidly losing behaviors learned over thousands of years that help them survive in a wild environment that includes predators. Have Durangoans played a major role in creating a safe zone for deer in town? Certainly guilty as charged! We have developed much of the winter range around Durango that once provided crucial habitat for deer. Our yards are replete with gardens, fruit trees, and tasty flowers. The riparian habitat along Junction Creek and the Animas River provides ample water and cover for deer to drink and bed in. I have heard multiple reports of town residents intentionally feeding deer. This is illegal and unhealthy for deer as they have unique nutritional requirements, often poorly understood by the folks who feed them. Other cities and towns throughout the country face similar issues with urban deer populations. Many have taken steps that, while controversial and often unpopular, have proven effective in reducing the population to a level supported by the carrying capacity of the local habitat. Urban archery seasons are established and effective in communities of various sizes from coast to coast in the US. Thirty-six municipalities and four counties in Virginia; eight towns in Arkansas; Highland, Utah; and Rock Island, Illinois utilize urban archery seasons to manage their in-town deer populations. There is no valid reason that Durango could not follow suit and implement the most successful and cost-effective method of urban deer population control. 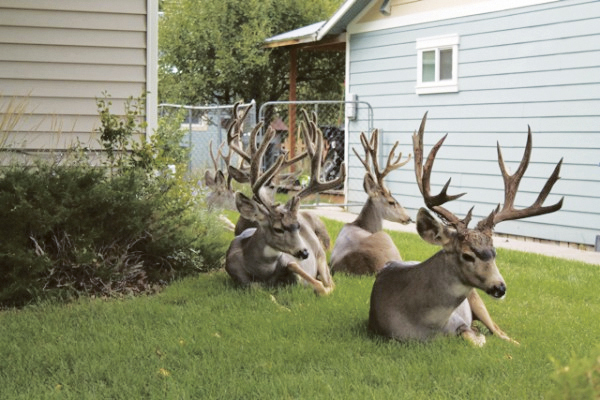 A well-administered urban archery season could be self-supporting by selling tags to archers who pay an administrative fee and pass a rigid test proving skills, knowledge of mule deer anatomy, and judgment. Hunting would only be allowed on publicly-owned land of appropriate size from an elevated stand. Our town is rife with skilled archers who would appreciate assisting with this problem while potentially providing high-quality protein for soup kitchens, homeless shelters and needy families. I believe it is time for us, as a community, to have an honest discussion about the town deer population and an effective management tool such as urban archery. The dialogue regarding this issue must occur prior to a probable higher density of mountain lions in Durango and the potential ramifications of such. Perhaps a census of the Durango mule deer population is in order so that trends could be documented. As with any issue a community faces, the devil is in the details. Talk with your neighbors, chat up your local CPW District Wildlife Manager and get their insights. Discuss it with your book, yoga, rodeo, hunting, hiking, cycling, gardening, or paddling group. Maybe, for now, this is a non-issue for most in Durango, but that could change with a single incident involving one of our children or a beloved family pet. Less than a month ago, the dog of one of my co-workers was horribly mauled by a deer. Durango is a wonderful place to live with a preponderance of highly opinionated individuals. A discussion about the town deer population could be emotional and divisive, but we need to have this talk sooner rather than later.